Maquillaje Natural Learn how to apply makeup easily with lots of tricks. Make yourself beautiful !! 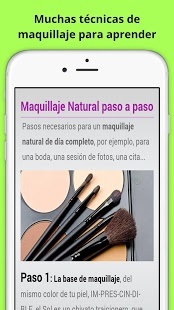 Maquillaje Natural is an app created by Trucos, Dietas, Maquillaje y Embarazo para todos. Maquillaje Natural has a rating of 4 on the Play Store, with 37 votes. Similar apps are: Princess MakeUp Salon Games (by Glam Girl Apps and Games), Eye Makeup (by ManQeem), Makeup Tutorials and Beauty Tips (by new apps), Eyes Makeup 2016 (by Trucos, Dietas, Maquillaje y Embarazo para todos), Makeup (by ModiFace), Professional Makeup (by Trucos, Dietas, Maquillaje y Embarazo para todos). Maquillaje Natural is currently available in the following countries: Peru, Switzerland, Romania, Israel, Turkey, Thailand, Germany, China, Japan, Denmark, Slovakia, Netherlands, Greece, Ukraine, United Arab Emirates, Poland, Estonia, Chile, Australia, Austria, Singapore, Indonesia, Czech Republic, Colombia, Croatia, France, United Kingdom, Serbia, Sweden, Latvia, Lithuania, Norway, Finland, Hungary, Belgium, Hong Kong, Spain, Taiwan, Philippines, Russia, Malaysia, Bulgaria, India, Canada, Mexico, South Africa, Italy, Brazil, Portugal, Argentina, Saudi Arabia, New Zealand, United States, Egypt, Vietnam. Become a glam princess makeup genius in creative 3D makeover games for girls!